A few weeks ago my husband & daughter worked on a very creative art project. And it turned out to be even more interesting by the time I get to the state of the piece of art now! We took the canvas with us to Arlington, TX where we had the family outing planned at Six Flags. Unfortunately, the canvas didn’t make it from the truck to the hotel room. Instead it sat in the 118 degree truck while we were screaming & laughing on the rides. Did you know that Crayolas can explode? Yup. So the canvas was hastily moved to the bed of the truck. A sad little lady was a bit disappointed. After our little girl returned to her other home with her mother, my husband rescued the canvas from the back of the truck. 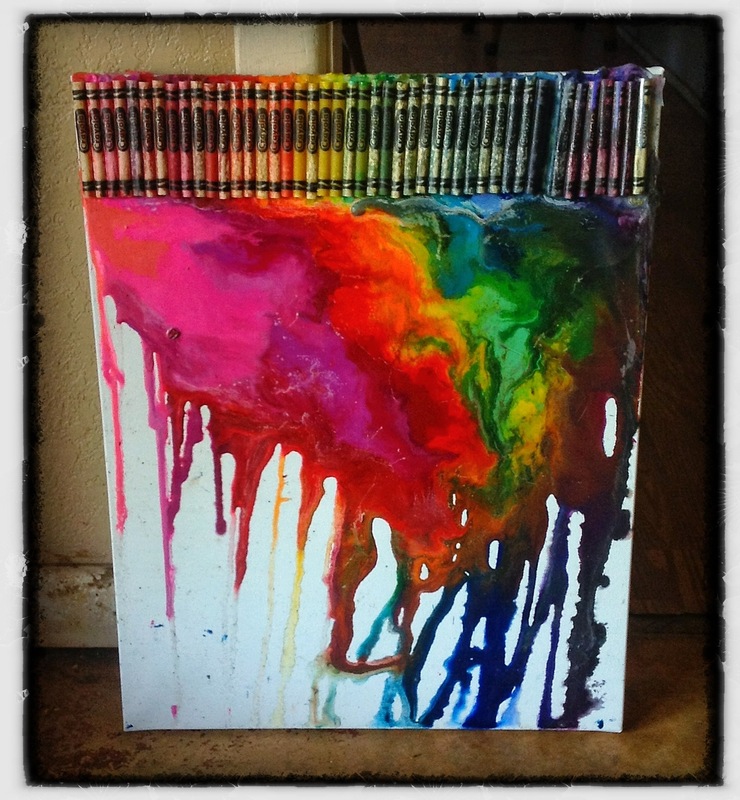 The Texas heat had melted the Crayolas down to empty paper shells! But the artwork was now a colorful blending that, I believe, no artist could replicate with a propane torch or lighter. So now we have a beautiful & whimsical piece of art created by daddy & daughter & the hands of nature (specifically Texas nature). A treasure! This entry was posted in Photo, Picture from yesterday and tagged art, canvas, Crayolas, daddy, daughter, Texas sun, torch. Bookmark the permalink. And bales to go before I sleep…. Love this what a wonderful lasting piece of art!! !